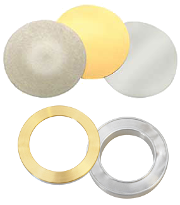 The disc or foil type sputter targets are available in 60, 57, 54, 50 and 19mm diameter. Most of the disk type targets are clamped to the target holder by a target clamping ring; simply unscrew the clamping ring and change the target. The B7340 Manual Sputter Coater is an ideal system for sample coating with Au of non-conducting samples for standard SEM imaging. The economical desktop unit is simple to operate, offers rapid pumpdown times, fine grain coatings and negligible sample heating. The safety interlocked sputtering supply is fully variable and the sputter current setting is not influenced by the vacuum level. Cool, fine-grain sputtering is achieved with a very efficient low voltage DC magnetron head. This coater is ideal for routine SEM sample preparation. It is compact, economical and simple to operate. It offers rapid pumpdown times, fine-grain coatings and negligible sample heating. 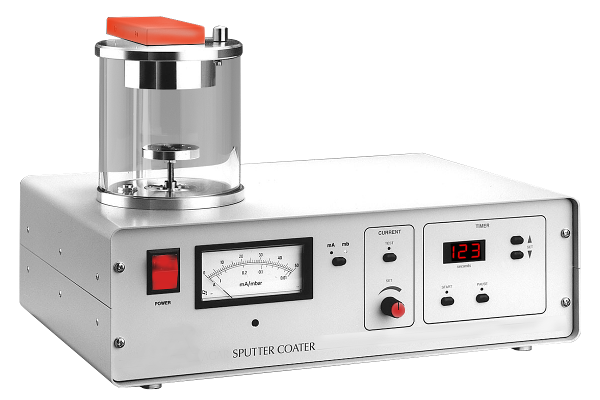 The standard manual coater has fully variable current control, digital process timer with "pause", variable height specimen table, hinged top plate and O-ring sealed vacuum chamber. Sputtering is achieved with an efficient DC magnetron. A quick-change target allows for a range of metals to be used. (Au, Au:Pd). Au target is included as standard. The current controller allows independent choice of sputter current and argon pressure. Coverage and grain size are optimized for any specimen. The safety interlocked sputtering supply is fully variable; setting the sputter current is not influenced by vacuum level. The optional thickness monitor is recommended for accurate measurements of depositions. This Manual Sputter Coater can be factory fitted or retrofitted at any time with the Resolution Thickness Monitor (optional). Sputter head: Low voltage planar magnetron.